MPL presents with the MIP405T a further development of the MIP405, even more focussed on special requirements like small size, wide temperature range and ruggedness. Optionally the MIP405T is available with conformal coating. Based around the highly integrated embedded PowerPC processors PPC405GPr with a CPU clock of up to 400 MHz (608DMIPS@400MHz) the MIP405T offers 10/100 Mbit Ethernet, one E-IDE port (44-pin), two serial ports and a Real Time Clock. Additional the 16-bit PC/104 (ISA) and the PC/104-Plus (PCI) interface offers easy and flexible expansion capabilities. The MIP405T can be equipped with up to 128MB SDRAM and up to 8MB Flash all on board soldered. Additional Flash (up to 1GB) can be plugged in. The MIP405T is being supplied with the Open Source U-Boot boot loader, providing various boot sources like Ethernet, IDE, flash. Also a MPL embedded Linux distribution and development chain is ready. Real-time OS BSP for VxWorks and QNX can be delivered with the product. The MIP405T is intended and designed for use in hardest environments with operating temperature ranging from -40°C to +85°C without the need of a heat sink or a fan. Special efforts have been taken on the quality of the components and their long term availability as well as on the low power consumption of the system which is less than 3 Watts at 400MHz. 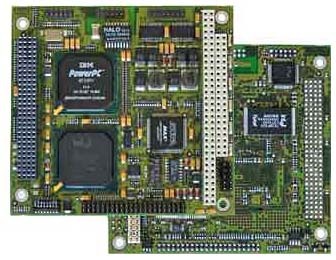 The MIP405T can be expanded with any PC/104 & PC104-Plus board. Development systems for the board are available with bootloader and a Linux, VxWorks or QNX distribution. Furthermore MPL offers together with the products professional engineering, support and consulting for hardware and software. All those features and specialties make the MIP405T ideal for any embedded control application requiring small size, high computing performance and low power consumption. Additionally the Board is intended to be used in rugged, harsh and even moistly environments and MPL guarantee for long term availability and quality. With this properties the MIP405T is being used in airborne and transportation systems, military, industrial or just any raw/secure application. EMC All interfaces are ESD protected, all possible precaution concerning EMC have been taken.